We all learn from experience. I have the fortune of being at a point in my career were I can give back to this industry and share some of my experiences to help others learn. I’m telling you about this episode because it was a career changing event for me. Although many years have passed since this incident happened, the lesson learned is as clear today as it was then. I started out many years ago working for a small HVAC company as an installer and couldn’t wait to be trained as a technician. The first chance to prove myself as a “service technician” came that winter when my in-laws’ forced air furnace suddenly stopped heating. At that time I had no service training, but was eager to learn how to repair HVAC equipment. The house was cold when I arrived so I checked the thermostat then crawled under the house to the location of the 20-year-old furnace and discovered the standing pilot was out. I checked the main gas line, gas valve, voltage to the valve, and the pilot gas line. I found that the problem was a stuck gas valve that would not allow gas to flow to the pilot assembly. Although I was pleased with my quick diagnoses, I did not have a replacement valve so I informed my in-laws that I would return the next day with a new retrofit ignition kit. The following day I returned with the new parts, crawled under the house and inspected the new retrofit kit, which had three major sections – the gas valve assembly, pilot assembly, and spark module assembly. Wasting no time, I soon had the old gas valve and pilot assembly on the ground and the new parts installed. The procedure seemed simple so I didn’t bother to open or read the instructions that came with the new kit. After changing the parts I immediately ran checked and cycled the furnace several times without any problems. I crawled out from under the house and closed the access door. Proud of my work as a “service technician” I let my in-laws know that the heater was now working again. The first explosion happened about 30 minutes after I left. My father in-law immediately called me. I assured him that the unusual sound he heard was the normal noise of his new retrofit kit. 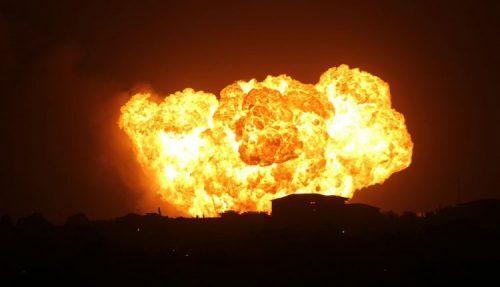 The second (and much larger) explosion occurred 40 minutes later – it lifted their German shepherd straight off the floor and into the air. A very unhappy father in-law called me again. This time he insisted on turning off the thermostat and unplugging the furnace, I agreed. Returning that night, I noticed that there were no longer any spider webs under the house. I sat down and read the instructions to the retrofit kit, something I should have done long before I ever attempted to work on the furnace. Although clearly stated in the instructions, I didn’t notice the directional arrow stamped on the bottom of the gas valve. I mistakenly installed the gas valve backwards. This error allowed the gas to flow unrestricted out of the pilot assembly during the off cycle. This raw gas slowly built up under the house until the thermostat called for heat. The spark module started the igniter, and the gas that had accumulated under the house ignited. Although there was no permanent damage, it was a while before I attempted to service furnaces again. Because of this event, I started reading the instructions on everything I installed and worked on from that point forward. This lesson is for installers and service-people currently in the field that feel they don’t need to read the instructions. I did not realize it at the time but this event changed the course of my career. Several years later I had learned so much by reading all the instructions, I was hired to be a technical support representative at the world largest privately owned HVAC distributor. Sometimes we have to hit the bottom to turn around. The HVAC industry is constantly changing and following the instructions sent with the parts and equipment can save time, money, and possible injury. There are many classes offered by manufactures, distributors, trade schools, and private organizations that cover the latest in servicing techniques and equipment. I would suggest new recruits in the heating and air conditioning field to attend every training class they can to learn about the newest HVAC equipment and to better your service skills… and always read the instructions!